What Is A Red Face? Why do people often have red face when drinking alcohol or beer? This is certainly the question of many people. This situation makes many people feel embarrassed. However, not only is it a normal phenomenon, it can also be a sign of some serious diseases like liver disease or cancer. This information makes many people feel nervous. 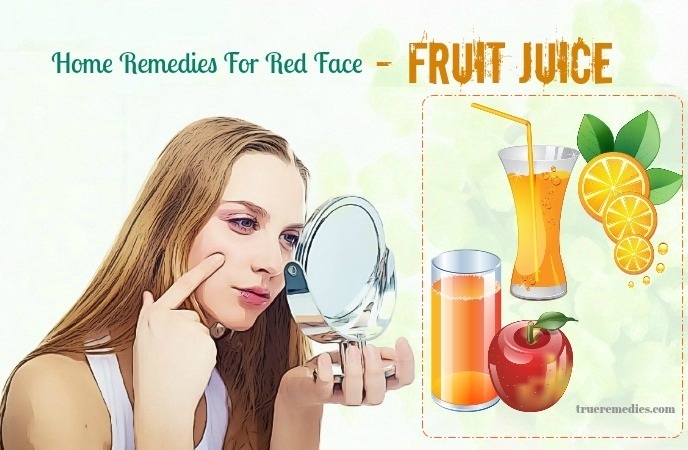 I know you read this article because you want to find out about red face as well as home remedies to get rid of this condition. That knowledge is presented in a very understandable way below. Make sure you do not ignore any important things. Red face is a common occurrence in many people when they drink alcohol or beer. Dr. Kenneth Warren, a biochemist at the National Institute on Alcohol Abuse and Alcoholism (NIAAA), said that not everyone could get red face syndrome when drinking alcohol. However, this syndrome affects 50% of Asians, mostly in East Asian countries such as Korea, China, and Japan. With Europe, the incidence of this syndrome is not high. Not only does it make people feel ashamed, but it can also be a sign of some serious diseases like liver disease, cancer, high blood pressure, etc. Alcohol contains ethanol. When entering the body, ethanol undergoes two metabolic steps in the liver. In the first step, the ADH enzyme converts ethanol to acetaldehyde. Second, the ALDH2 enzyme converts acetaldehyde into acetate (acetate acid commonly found in vinegar). Of the three active ingredients, acetaldehyde is the most toxic because it is capable of causing DNA mutations and cancer (the toxicity of ethanol is usually low, and acetate is relatively harmless). When it builds up in the blood, it will cause some things like red face, heat, vomiting and tachycardia. Acetaldehyde is also the culprit of these “aftereffects” such as headache and thirst in the morning after drinking the night before . What Are Common Causes Of Red Face? The process of converting alcohol from ethanol into acetaldehyde is governed by a gene with the same name as the enzyme ALDH2. The ALDH2 gene has two versions: Glu (G) and Lys (L). Thus, in the population there are three groups of people with three genetic variants: GG, LG and LL. The human body with LL variant is unable to metabolize acetaldehyde effectively, so this active substance accumulates in the body. When drinking alcohol, people with LL often have some symptoms such as red face, vomiting and heart palpitations. 30-40% of East Asian people have this variation. People with LG variants have good acetaldehyde metabolism so they have higher drinking capacity than those with LL variants. In addition, each person has a different response to blood alcohol levels. High alcohol content will make the capillaries dilate. At this point, in those who are less able to respond, the areas of the body where there are many capillaries such as the eyes and thin areas such as face, neck and back are more likely to be red. This explains why when drinking, many people have red face phenomenon, while others do not. Esophageal cancer is a common disease among Asians. This is a serious disease because about two thirds of patients die within five years of being diagnosed. Many studies have shown that drinking more alcohol, the risk of esophageal cancer increases exponentially. The risk of esophageal cancer depends on the genetic variation. People who drink alcohol and are with LL variant are at higher risk for cancer than people with LG and GG variants. However, because of red face, vomiting and heat, LL carriers often do not drink much. Thus, esophageal cancer usually occurs in people with LG and GG. According to Korean experts at Chungnam National University (Korea), red face could be a warning sign of high blood pressure. They have done a lot of experiments and surveys on this issue. Although the specific cause of this has not been specifically explained yet, according to experts, this may be due to the accumulation of acetaldehyde – a substance that is produced by alcohol when it is degraded by the liver. Acetaldehyde can dilate the blood vessels under the skin, reducing blood flow to the central organs. Therefore, the body tries to “compensate” for this shortage of blood by secreting hormones, leading to high blood pressure. With these findings, the expert team recommends people who usually show signs of red face after drinking alcohol to limit alcohol intake. The liver is the body part that is most affected by alcohol. Increased alcohol consumption and long-term drinking are more likely to increase the incidence of liver disease. Accumulation of acetaldehyde will cause liver disease. Accordingly, people with red face syndrome when drinking alcohol will be more likely to have liver disease than those who do not suffer from this syndrome. The liver diseases that they are most prone to are fatty liver, hepatitis, and cirrhosis. What Are Common Symptoms Of Red Face? Your face is pink or red after you have drunk a little alcohol or beer. Feeling hot in the face or throughout the body. Feeling dizzy and nauseous right after drinking a little alcohol or beer. As we mentioned above, people with LL variants are at high risk for this condition. In addition, people who are weak, who are sick or who are experiencing psychological problems (such as stress or anxiety) may also experience this condition.You can control this disease by minimizing risk factors. Please see your doctor for more information. If the red face is accompanied by other signs such as nose bleeds, difficulty breathing, writhing abdominal pain you should see a doctor to be promptly rescued. This is really a state of emergency. In addition, if this has happened to you in the recent past (you have never been before), you should see your doctor for a checkup and diagnosis. You probably have one of the diseases that we mentioned above . There, you have discovered some information about red face. This is a fairly common condition. When faced with this situation, everyone wants to find ways to overcome it. If red face is simply a body reaction to alcohol, you can completely apply these home remedies we introduced below to solve your problem. 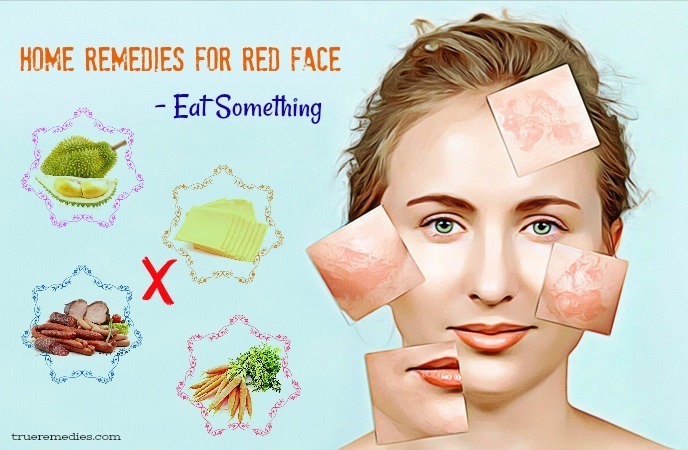 It is time to find out what the effective home remedies for red face and neck are. Take a look at TrueRemedies.com! 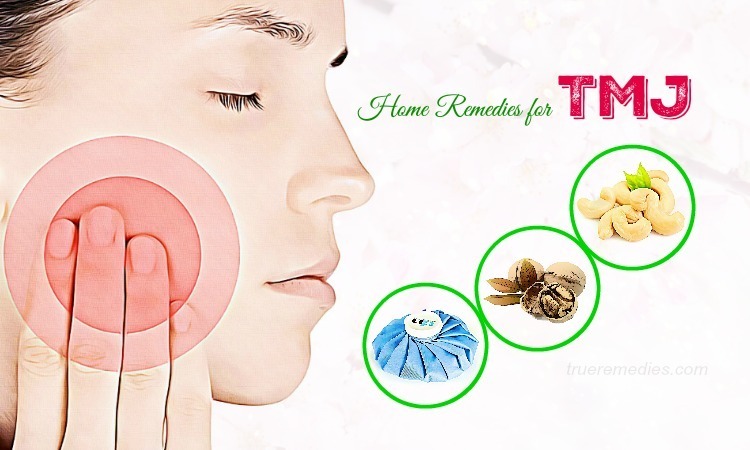 This is the first treatment in this list of home remedies for red face and neck. Many experts recommend that before drinking alcohol you should eat something. This is a ‘soakage’ solution that many people often adopt. When the stomach is empty, ethanol is easily absorbed into the body. There is no obstruction in the stomach. Ethanol is in direct contact with the stomach, permeates the bloodstream and rapidly affects the nervous system. This makes you very vulnerable to red face. 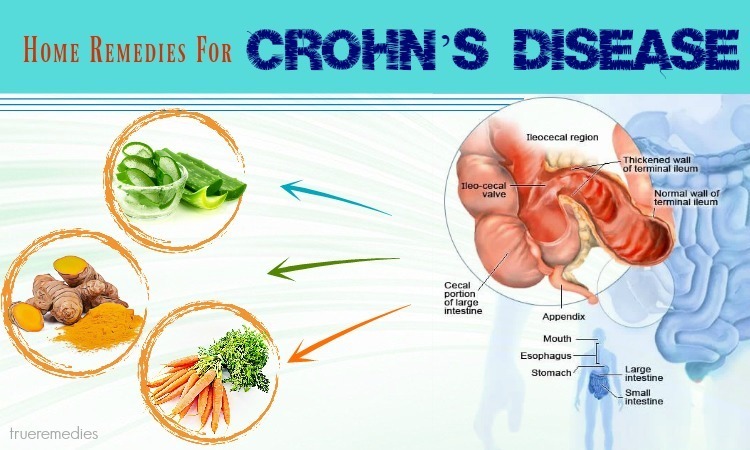 In addition, drinking alcohol when the stomach is empty can easily cause gastric diseases such as gastric ulcer. In addition, when hungry, the amount of acid in the stomach increased. These acids combined with alcohol in wine or beer will make you more likely to have symptoms such as red face, dizziness and nausea. Cheese is a food that many people use to combat red face syndrome. This is a very effective tip, but cheese can make the user indigestible. Some researchers point out that when combined with alcohol, cheese will cause bad effects on the heart, making you more likely to have red face symptoms. Therefore, do not eat cheese before, during and after drinking. This is the result of scientific research by two researchers John Maninang and Hiroshi Gemma University of Tsukuba, Japan. According to the study results, high sulfur content in durian reduces the decomposition of alcohol. The results show that: Durian extract inhibits the activity of the enzymes which decontaminate aldehyde (toxins in alcohol) to 70%. At that time, the body is at high risk of alcohol poisoning. Many people have died for this reason. Eating sausages and smoked meat can increase the taste of alcohol, help drinkers feel better. However, these foods contain organic amino acids. Through the process of food processing, these foods will produce polycyclic hydrocarbons, amino acids and even benzopyrene. When combined with alcohol, these substances will combine together, causing bad effects on the digestive system. In particular, these foods contain preservatives. These substances combined with alcohol will cause bad effects on the liver and throat. There are lots of delicious foods that contain carrots. Carrot is a very good food for blood. However, before, during and after drinking, you should not eat foods that contain carrots. When combined with alcohol, carotene in carrots produces toxins that are very harmful to the liver. In particular, you should not drink carrot juice. Carrot juice makes the harm increase many times. The red face is unavoidable. Even then, the use of ways to treat red face symptoms is very difficult to achieve the best effect. Among home remedies for red face and neck, using olive oil is one of the most effective. Many of us know that olive oil is good for the stomach. You should drink 1 tablespoon of olive oil before drinking to avoid red face phenomenon. This is the experience of the Mediterranean people. Basically, olive oil works the same way as fat. Olive oil creates a membrane for the stomach. When this natural oil enters the stomach, it will protect your stomach, causing the alcohol to be absorbed into the stomach wall. For that reason, before drinking, let’s drink 1 tsp of olive oil or eat a salad dressed with olive oil to limit your red face problem. This is another must-try home treatment in this list of home remedies for red face and neck. Jim Koch, co-founder of Boston Beer Company, said that his company had a way of keeping consumers from facing red face syndrome when drinking: dry yeast. Take 1 tablespoon of dry yeast before you start drinking. This is a type of yeast commonly used to make cake made from wheat flour. It is rough, big and brown. You can buy this dry yeast at grocery stores or bakeries. For more delicious, you can mix dry yeast with yogurt. 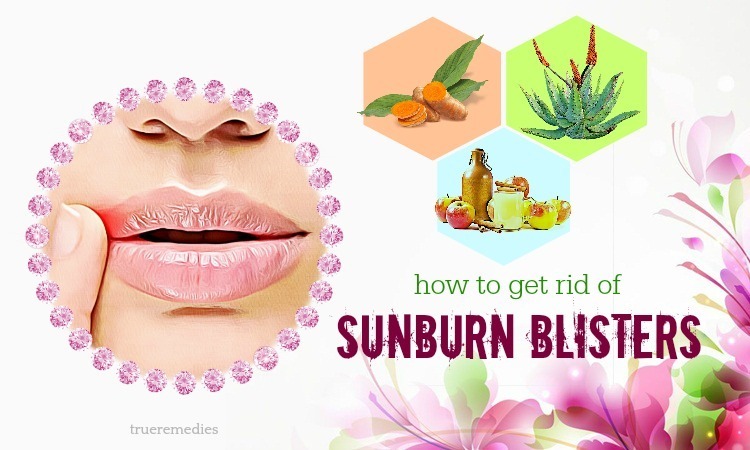 This remedy is one of little – known home remedies for red face and neck. Fruit juices such as orange juice and apple juice contain lots of amino acids and fructose. These ingredients work to neutralize the alcohol content of wine. Thanks to that, you can prevent red face. Besides, you can drink a little bit of artichoke tea. If you drink tea, the tannin content in tea is more likely to accelerate the absorption of alcohol into the stomach and cause more harm to the stomach. However, a glass of red artichoke tea will be very good because this is the herb that can dissolve alcohol very well. It will help you a lot in the fight against drunk feeling. Besides, juice from green vegetables such as spinach and mint works to prevent dehydration in the body and provide you with electrolytes needed. The next treatment in this list of home remedies for red face and neck rash is drinking water. In fact, there are many people who face red face symptoms when drinking alcohol. That is because they rarely lose water when drinking. They may be less sensitive to the effects of acetaldehyde – the toxic substances produced when alcohol is metabolized in the liver. But that does not mean they can be immune to the long-term effects of alcohol. Water also speeds up the process of eliminating alcohol from the body through the urinary system, making you not drunk or blushing when drinking alcohol. Before drinking beer or wine, experts recommend that you drink a glass of water to avoid the body suddenly receive strange water, which can cause dizziness. Besides, let’s drink plenty of water after drinking. This is good for you. This sounds strange when it comes to home remedies for red face and neck, but it really works. While drinking beer, try to laugh a lot to create a happy atmosphere. When you talk and laugh a lot, your breathing improves. This will help the alcohol be pushed out through the “breath”. This reduces the effect of alcohol on the body. As a result, you can limit your red face syndrome. In addition, speaking and laughing helps to distract your brain. At that time, you no longer worry about whether your face has become red or not. This also greatly improves your condition. This is one of the little-known home remedies for red face and neck rash. Your body needs about an hour to digest 30ml of alcohol. Therefore, the faster you drink alcohol, the faster the body loses the ability to resist the attack of alcohol. Five minutes after drinking alcohol, ethanol in alcohol begins to enter the blood vessels. The next 30 minutes is the period of ethanol that continues to spread to other parts of the body. This time is also when the alcohol gets into your brain and you get a sense of being drunk which lead your face to become red. Your body needs enough time to burn off the amount of alcohol. To get rid of the red face, you should drink alcohol slowly bit by bit. The next one in this list of home remedies for red face and neck is vitamin B. Vitamin B is a group of water-soluble vitamins that play an important role in the metabolism of the body, particularly the metabolism of carbohydrates into sugar and the metabolism of fats. There are eight types of vitamins in the B group. Each vitamin performs a different function, and they also work together to keep the body healthy. One of the causes that make you feel uncomfortable when drinking alcoholic beverages is that your body loses vitamins in the group B. When your body loses vitamin B, its ability to nourish the nervous system will be reduced. Blood will build up to protect the nervous system and cause redness in the face. Therefore, taking vitamin B6 and other complex vitamin B will help you a lot in the fight against the feeling of drunk. Vitamin B is easily found in foods such as milk, cauliflower, carrots, cantaloupe, apricots, almonds, peanuts and dark green vegetables. When people drink alcohol, the body absorbs it immediately through the gastrointestinal tract. When it reaches the maximum alcohol, liver, kidney, lung and other organs will be subjected to the destruction of acetaldehyde which is very harmful to the body. At the same time, the brain will fall into a state of neurological depression, loss of temporary control of some partitions. Milk helps to limit the metabolism of acetaldehyde, restricts the absorption of alcohol into the bloodstream, slows down the absorption of alcohol in the body, protects and reduces the stimulation of alcohol with the stomach then decreases the redness of the face. Therefore, to reduce the redness of your face while drinking you can drink milk or yogurt . The strength of probiotics contained in yogurt can reduce the discomfort of your abdomen. 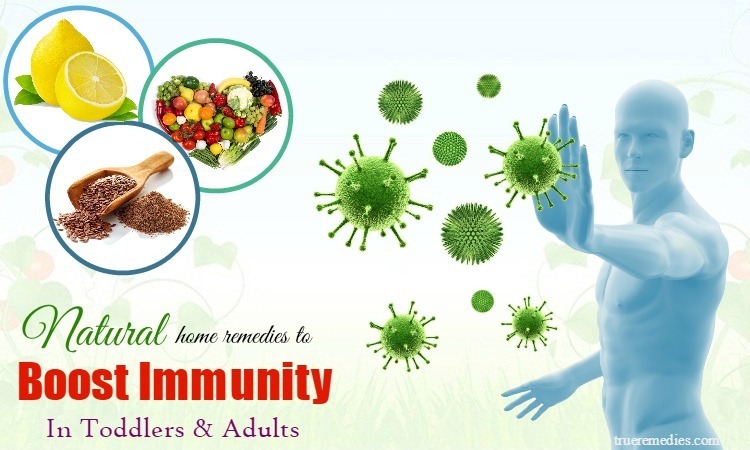 Lactobacillus bacteria can balance and push harmful bacteria out of your body. 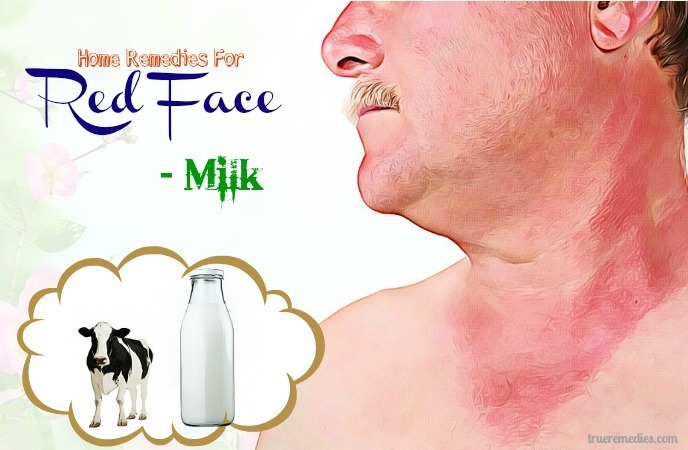 Drinking milk is reckoned one of the best home remedies for red face and neck. Note: To make this remedy better, you can drink milk before drinking alcohol. Drinking coconut water is the last remedy in this list of home remedies for red face and neck after drinking. Coconut water is beneficial for the body because it contains many vitamins and minerals such as calcium, Potassium, Chloride, Vitamin A, E. In addition, it also acts to lower blood pressure, reduce blood sugar, and help to protect the health of the bones and teeth. One of the health benefits of coconut milk is that it helps the body boost its immune system and fight off bacteria. Coconut water can help reverse the bacteria entering the stomach, preventing colds and flu. Coconut water contains less sugar and less sodium than other sports drinks but it is high in potassium, calcium, and chloride to supplement and enhance the energy level of the body. Because coconut water is rich in potassium and other minerals, it regulates the internal fluid and replenishes water for the body. It has been used to treat dehydration whenever you have dysentery, cholera, diarrhea, flu, and electrolyte balance. Therefore, the using of coconut water for red face will give the best results. The above-mentioned home remedies for red face and neck are claimed to be able to reduce the symptoms of this problem. They are very simple and effective, so choose some of them and alternate them in your treating to see how effective they are. 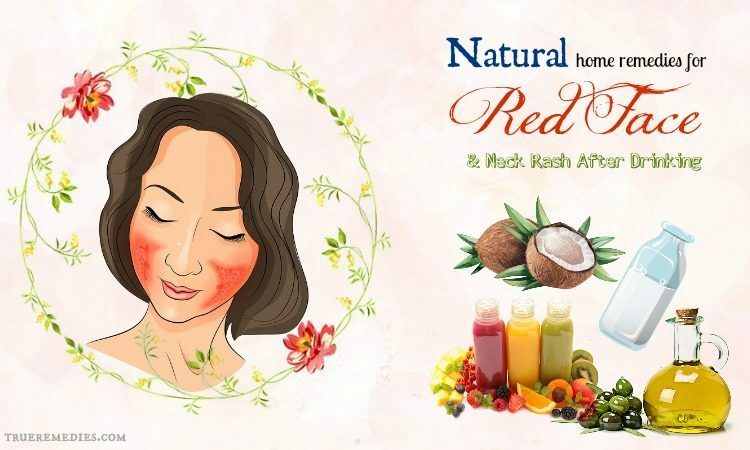 If you have any contributing ideas about our article of “Top 10 Natural Home Remedies For Red Face And Neck Rash After Drinking” introduced in Home Remedies Category, do not hesitate to drop your words below this post. We will answer as soon as we could.